While it has a smaller footprint, the 13-inch Retina model has enough ports to justify its "Pro" moniker. 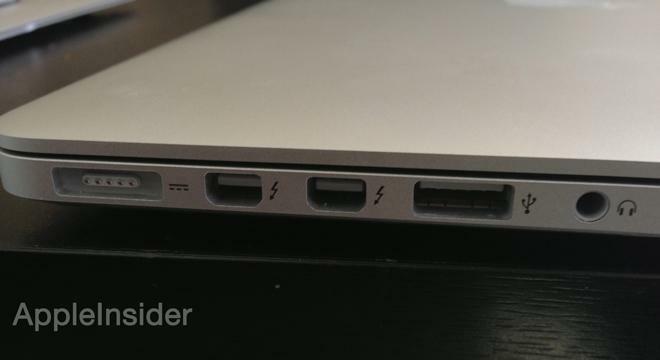 On the left side are two Thunderbolt ports, a USB 3.0 port and a headphone jack, while the right side of the machine has another USB 3.0 port, an HDMI port and an SDXC Card slot. In shrinking its footprint, the MacBook Pro did lose dedicated FireWire and Ethernet ports, as well as the SuperDrive, though adapters and accessories are available. The Retina display model has one extra Thunderbolt port versus the legacy design, which features just one high-speed I/O. 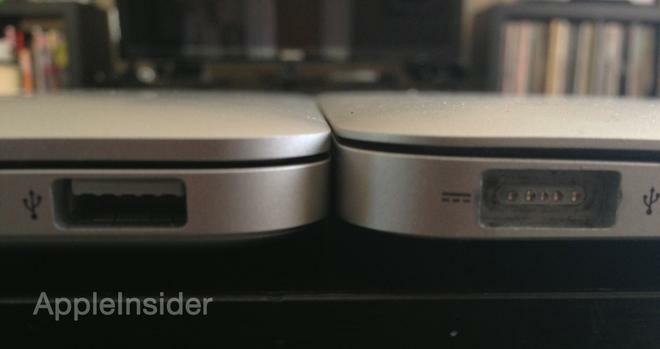 We view these trade-offs as a plus for the MacBook Pro. There are also dual microphones for noise cancelation, and stereo speakers that sound good. The chiclet-style keyboard is backlit, and the glass trackpad is as great as it has been for years. The 13-inch MacBook Pro with Retina display also has the new, thinner MagSafe 2 connector on its left side. This is a minor annoyance for anyone who has an accessory like a Thunderbolt display, as an adapter for the MagSafe charger will be necessary.